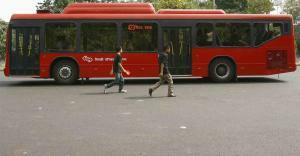 There are multiple modes of public transport available in New Delhi for a tourist. 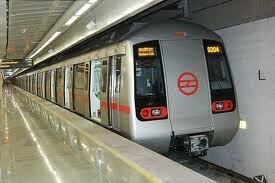 The recently introduced 'Metro' is fast becoming a popular transport with fares ranging from Rs. 15/- to Rs. 50/- (approximately Rs. 50/- to one US dollar). However, the Metro has not reached all parts of the capital, and there is a lot of construction ongoing in and around the capital as a result of the 'Metro Project'. Prior to the Metro, DTC buses were the most commonly used public transportation which in the last few months have evolved into 2 types of buses the 'green' and the 'red'. The Green Buses with fares of Rs. 5/-, 10/-, and 15/- for those on a tight budget, and the air conditioned Red Buses with fares of Rs. 15/-, 20/-, and 25/- for those who cannot withstand the extreme temperatures. I will probably not get a chance to travel on either because of friends who send me their cars whenever I need to go out. The CNG (compressed natural gas) Auto-rickshaw is another intriguing 3 wheel mode o f transport where the minimum fare is Rs.35/- ; apparently, the rickshaw driver pretty much decides on how much you will pay despite the existence of a tariff meter. Then, there are of course the yellow top cabs which run in most places in Delhi, but I am told that even there the cab driver overrides the tariff meter. Besides the yellow tops, there are private taxis that you can rent on an hourly, daily, and or weekly basis. I hired one of those a few days ago at Rs.800/ - for a period of 8 hours. 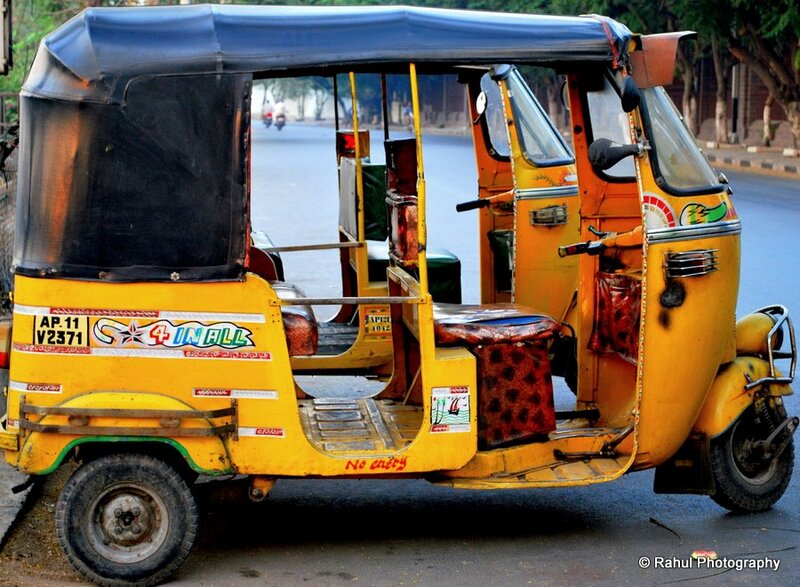 Apparently, this mode of transport is a hot favorite with NRIs (non resident Indian). Transportation, in the Indian context, is very varied. There is also a sizable population that travels on bicycles, cycle rickshaws, and also bullock carts, and the presence of all of these on the roads affect the travel speed in this capital city. The speed on most of the inner city roads is between 25 - 50 km per hour, though I have to admit that I have yet to experience a speed of more than 40km per hour. In fact, just yesterday I was on the road from 10:30AM to 9:30PM, and the average speed of the car must have been 25 km per hour. Talking about my day on the road yesterday...I witnessed the most interesting interaction between the drivers of two vehicles that were both moving side by side on a packed highway where, if I put my hand out the window, I could touch the outer rim of the auto-rickshaw that was driving alongside! Well, it so happened, that my friend, who was driving me around in Connaught place (the Times Square of New Delhi), was unsure of the route to our next destination and needed directions. Given that the GPS has still not made an in road into the Indian market, and that road maps are an unknown commodity, even at the gas stations, my friend resorted to doing what she always does when in need of directions: she rolls down both the driver window and the passenger side window and within less than 5 seconds an auto-rickshaw draws up on the passenger side, the driver of which is busy talking on a cell phone. My friend then yells out to the driver, who hears her over the din of that bustling neck to neck traffic, and then, through monosyllabic sounds and hand and neck gestures, gives directions to my friend. She, in the meanwhile, is driving and negotiating turns and aggressive drivers like you cannot imagine, and is therefore only able to hear but the first two directions the auto-rickshaw driver gave, so after following those two, she again rolls down the window and has another brief conversation with yet another auto-rickshaw driver, and we finally succeed in getting onto a road that my friend recognizes! This was clearly better than any GPS experience that I had ever had! :) hey, it's nice to know that you are here! Public transport used to be a real nightmare in Delhi. The metro changed it a lot. But there remain the buses... which I have heard have changed. I once wrote about my experience in the blue line buse on my previous blog jhansi ki rani. That was a real Delhi road experience and you are right it is better than any GPS! It is Yellow color autriksha, I too lives in Delhi, but never see it in yellow color.